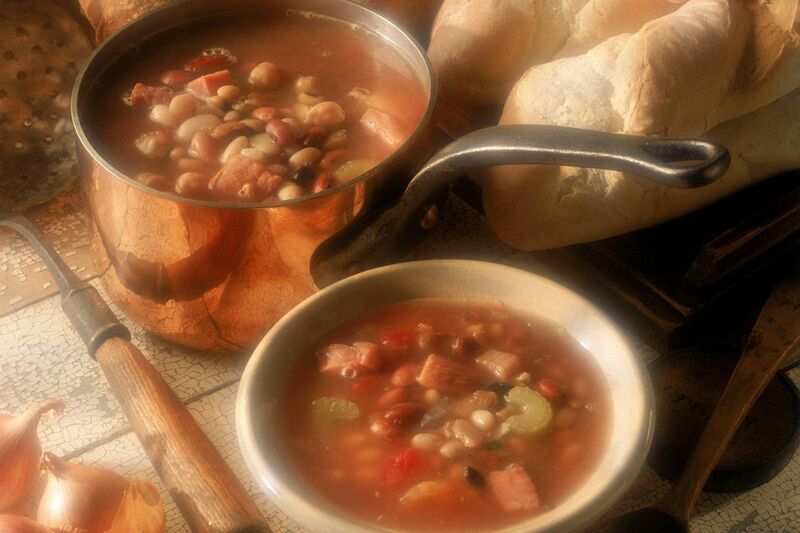 This navy bean soup is super easy to make with beans, ham, and tomatoes. The combination of tomatoes and a meaty ham bone provide wonderful flavor and will have you coming back for seconds. We guarantee it's a soup you'll appreciate on a cold winter's evening, or even as a heartwarming lunch option as well. Add some leftover diced ham to the soup if you have extra, or use ham hocks instead of the ham bone. Made it a hearty meal by serving this tasty soup with cornbread or crusty homemade bread and a tossed salad. A homemade baguette would be wonderful or make an easy no-knead bread. Cover beans and ham bone with 1 1/2 quarts water, then add celery, onions, tomatoes, and parsley. Cover and simmer for 4 to 5 hours, or until the beans are tender. About halfway through the cooking time, remove the bone from the soup. Remove the ham from the bone and dice it. Return the diced ham to the soup and continue cooking. Garnish servings with fresh chopped parsley.